Who is Chewbacca? Just how tall is he? What is his most dangerous adventure? Perfect for children who are new to Star Wars and also for young fans of the movies, this exciting guide will answer these questions and many more and teach children fun facts about loyal Wookiee Chewbacca - including his incredible adventures with Han Solo, Princess Leia and other rebel heroes!Follow Chewbacca's journey from Han's smuggling sidekick, to loyal Rebel fighter and co-pilot to Rey in the Millennium Falcon. Discover what languages Chewie speaks, why he makes howling noises, which planet he comes from and what makes him lose his temper. Featuring a simple Q&A format and exciting images, DK's Star Wars Meet the Heroes- Chewbacca is a fun, welcoming introduction to the famous Wookiee as children follow his adventures in a galaxy far, far away. With colourful movie stills from the original trilogy, prequels and the latest sequels, DK's book lets children explore Chewbacca's amazing world. & TM 2019 LUCASFILM LTD.Who is Chewbacca? Just how tall is he? What is his most dangerous adventure? Perfect for children who are new to Star Wars and also for young fans of the movies, this exciting guide will answer these questions and many more and teach children fun facts about loyal Wookiee Chewbacca - including his incredible adventures with Han Solo, Princess Leia and other rebel heroes!Follow Chewbacca's journey from Han's smuggling sidekick, to loyal Rebel fighter and co-pilot to Rey in the Millennium Falcon. Discover what languages Chewie speaks, why he makes howling noises, which planet he comes from and what makes him lose his temper. Featuring a simple Q&A format and exciting images, DK's Star Wars Meet the Heroes- Chewbacca is a fun, welcoming introduction to the famous Wookiee as children follow his adventures in a galaxy far, far away. With colourful movie stills from the original trilogy, prequels and the latest sequels, DK's book lets children explore Chewbacca's amazing world. 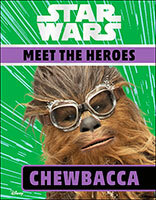 & TM 2019 LUCASFILM LTD.
Get to know Chewbacca and follow his many adventures across the galaxy in this new series.